Is there a thin layer of plastic covering your romaine lettuce? First E. coli, now this? Romaine lettuce at a grocery store. A recent video shows a woman peeling off what appears to be a thin plastic film from romaine lettuce is circulating the web and is causing a buzz online because of the recent nationwide E. coli outbreak affecting romaine lettuce. In the video uploaded to Facebook by Karen Martin Collins, she claims that lettuce sold at stores is contaminated and is attempting to prove that by showing her peeling a layer of something off of lettuce. The video has been shared by thousands of people on social media and many are associating it with the recent romaine lettuce E. coli scare that has caused at least 80 infections and more than 40 hospitalizations, according to the United States Centers for Disease Control earlier this week. At this point, you’re probably wondering if the video is fake or if a thin, plastic-like coating can be spotted on contaminated leaves of romaine lettuce. Considering the recent health scare and buzz surrounding E. coli and lettuce, we understand your concern if you’re still feeling iffy about eating lettuce. The video being shared on social media is real, however, the plastic film she is peeling off is not necessarily related to a contamination. According to Snopes, the film-like coating you’re seeing is widely known in the agricultural world as epidermal peeling. It has nothing to do with contamination and is not related to E. coli The coating is not “plastic” at all. Instead, it is the "epidermal" or skin layer of the lettuce. The woman in the video appears to be experiencing an extreme case of epidermal peeling. Epidermal peeling occurs when freezing weather conditions cause blistering in romaine and other types of lettuce, causing it to form a thin protective layer on the leaves that can be peeled off. Markon, a major food service company that produces fruits and vegetables says epidermal peeling is a completely natural occurrence but when it happens to their crops, it becomes difficult for lettuce to be harvested and processed. Videos like the one posted to Facebook have been circulating for years. In this case, the video went viral because romaine lettuce has been in the news recently because of the E. coli scare. While the thought of peeling a slimy coating of skin off lettuce is enough to make anyone’s stomach turn, it is good to know it is a natural phenomenon that has to do with rapid temperature changes where lettuce is grown or stored. 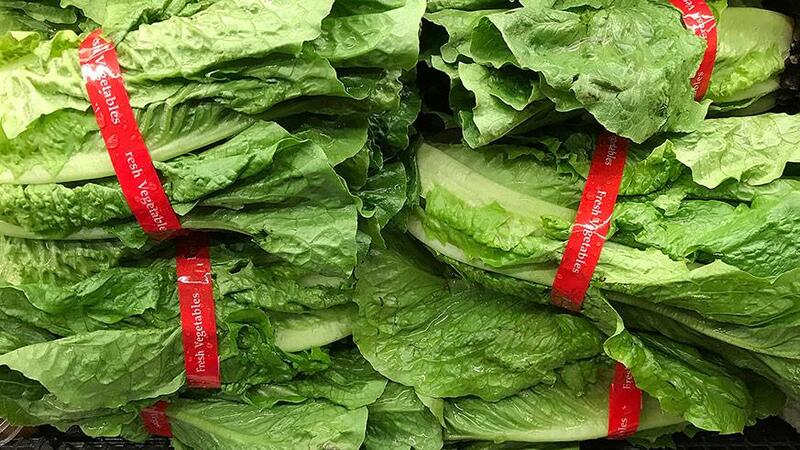 It's safe to say that if you reach for your romaine lettuce and notice it is peeling, it is normal and not linked to the recent E. coli scare affecting lettuce. Lifestyle - U.S. Daily News: Is there a thin layer of plastic covering your romaine lettuce?